Have you decided to visit London in the near future or on your next holiday? Then you do not need to worry about accommodation, as there are many options to choose from. Some are located in central areas, other offer special promotional prices and many have luxurious lounges and facilities. The big question is if there are accommodations that manage to somehow offer all of the above mentioned qualities. And the answer is yes. An example of such a great hotel is Holiday Inn London – Regent’s Park. Situated nearby Oxford Street and close to Heathrow Airport, this building is perfect for tourists that want to see local attractions. They can simply walk to Madame Tussauds or take their children to the London Zoo. And these are just some small hints of all the other entertainment options. Moreover, beside the lovely room facilities, you can also use private or public means of transport and travel to any district in London. In order to get a Heathrow to Holiday Inn London – Regent’s Park Transfer by rail there are three main options. First of all, you could take the train from Heathrow Terminal 1 (every 15 minutes), followed by a Tube from Paddington Underground Station (every 5 minutes). This journey will take about 30 minutes in total. The second option is the Tube from Heathrow Terminals 1-2-3 (every 5 minutes). This journey lasts about 49 minutes. You can also choose a bus from Heathrow Central Bus Station (every 60 minutes) and the journey will take approximately 1 hour and 3 minutes. A Heathrow to Holiday Inn London – Regent’s Park Transfer by car can be done by taking the M4 motorway. Heathrow Airport is at an 18.6 miles distance from Holiday Inn London – Regent’s Park. This journey will take about 35 minutes, without including traffic. A Heathrow to Holiday Inn London – Regent’s Park Taxi Transfer with 247 Heathrow Airport Transfer is going to take about 37 minutes, including rush hour traffic. 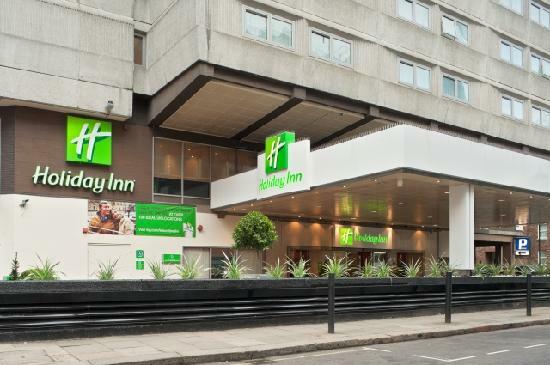 The price for a Heathrow to Holiday Inn London – Regent’s Park Taxi starts from 39 GBP.